Chris putting some finishing touches on the mural. Watch a video of the making of the mural here. 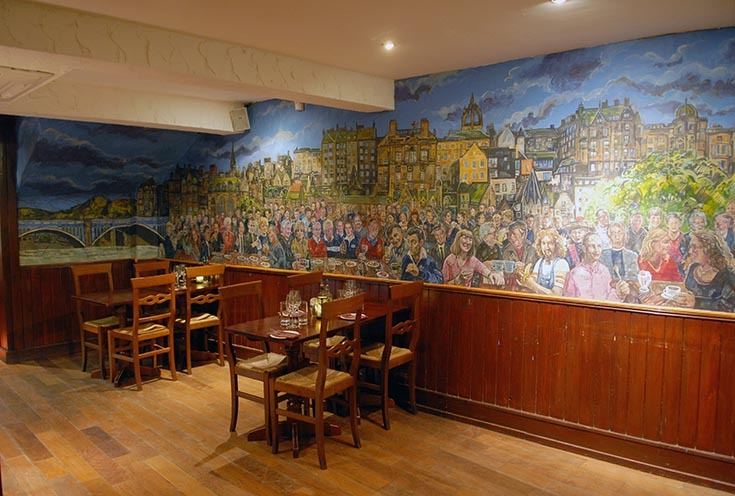 I’ve known the owners of Edinburgh restaurant A Room In The West End for a number of years as I became friends with Peter Knight while playing with Boroughmuir Rugby Club. I celebrated my 40th birthday with a meal at the restaurant; the food was great but a previous mural in the subterranean location was looking tired and needed refreshing. As the wine flowed I apparently told Peter this, and my charming rant must have struck a chord as several years later he called me up to commission a new mural. The previous mural was in need of an update. 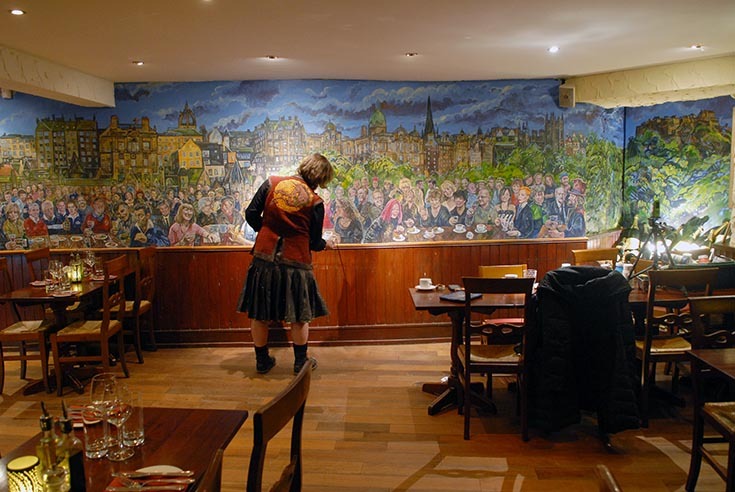 A Room in the West End is already an established fixture on the Edinburgh culinary scene; the food is excellent and it’s nestled below Teuchters – a great bar in its own right. 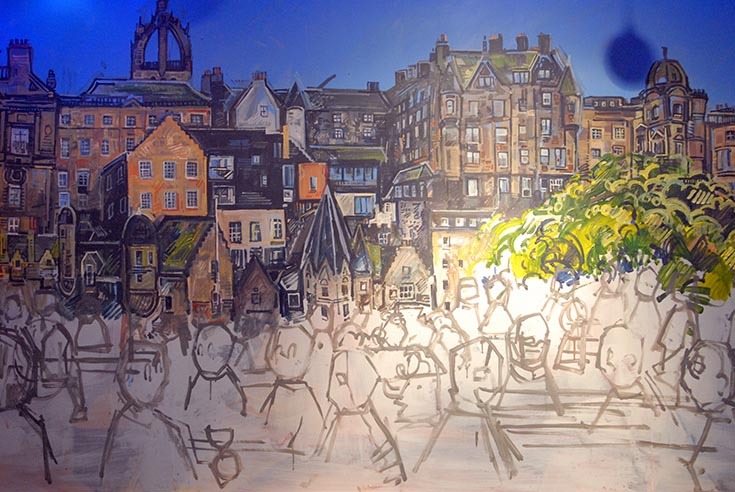 Owners Peter and John wanted me to paint a cafe crowd scene to create a buzz in the space and reflect their central Edinburgh location with an urban horizon that made the room look bigger. Chris begins to build the city as a backdrop for the bustling cafe scene. 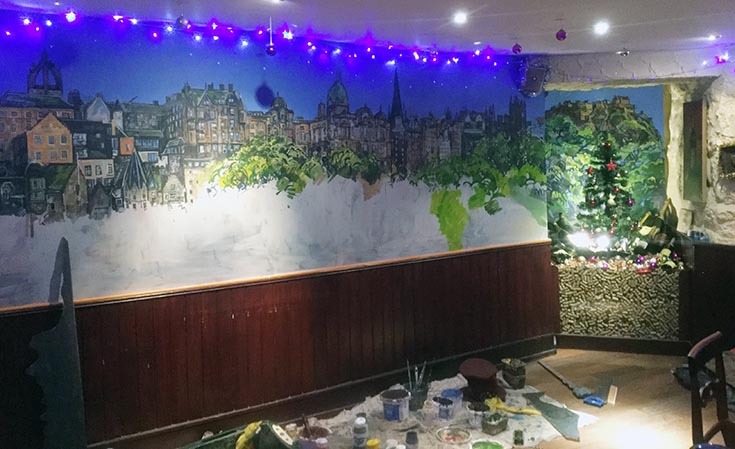 In mid November 2016, my wife Fiona and I got to work in the restaurant, covering the the old mural with an undercoat for my painting. I then began painting the Old Town landscape from one end to the other, and then worked back again, fixing all the roofs and windows. This took about week in total and I now know the Old Town horizon line in minute detail! Edinburgh’s Old Town stretches across the wall. As this was in the build up to Christmas, fairy lights and baubles were hung from the paintings, doors and ceiling by Carol, one of the managers. As she was passing by me, I popped Santa on top of the Bank of Scotland at the top of the Mound for a little bit of festive fun. Setting up the layout of the crowd scene before adding the individual portraits. Painting in the first portraits – the two Sheilas. Scottish rugby commentator Bill McLaren force-feeding Hawick balls to Gavin Hastings at the sporty table. I then began painting the crowd. Owner Peter and managers Stephen and Carol provided me with photo reference from some of the regulars in the bar. 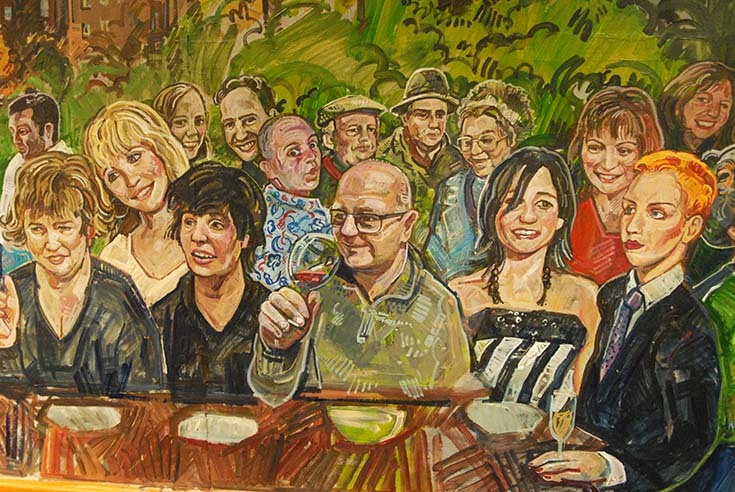 I started in the middle in a well lit area with portrait of Sheila Denney stood next to her good friend (and my studio manager) Sheila Masson. Scottish football manager and player Alex Ferguson with his wife Cathy. Then I started to move down. The first celebrity that I put in was rugby commentator Bill McLaren – I had him handing out Hawick ball sweeties to a flustered Gavin Hastings, with his brother Scott laughing as he looks on. 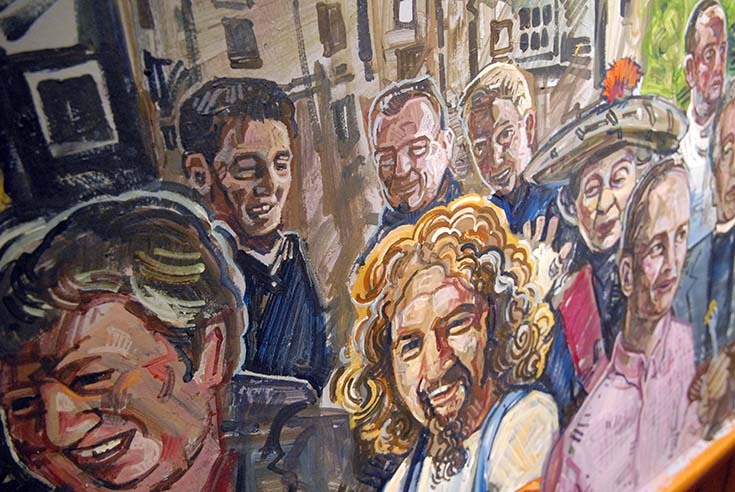 After setting the background scene I started to fill in the crowd, first painting some restaurant and bar regulars and then I had great fun painting the Big Yin – Billy Connolly. I decided to pop the 80s children’s tv star Super Gran in the background behind Billy as he appeared in the show and sang the theme tune. 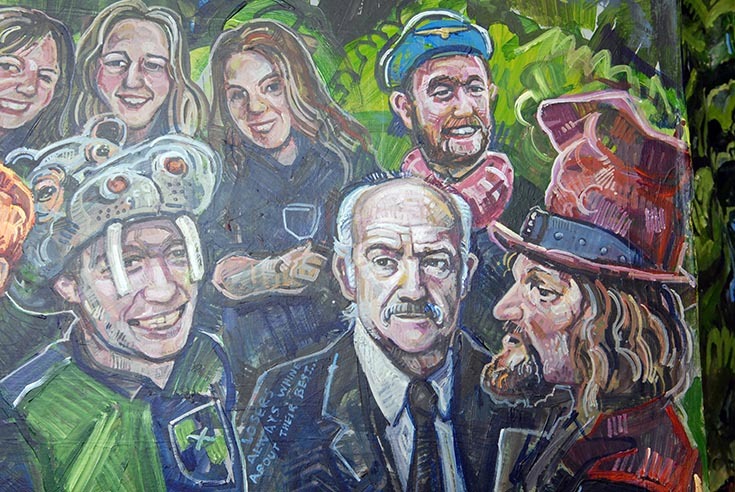 Close to Super Gran and Billy Connolly I painted the Reverend I.M. Jolly, aka Rikki Fulton. 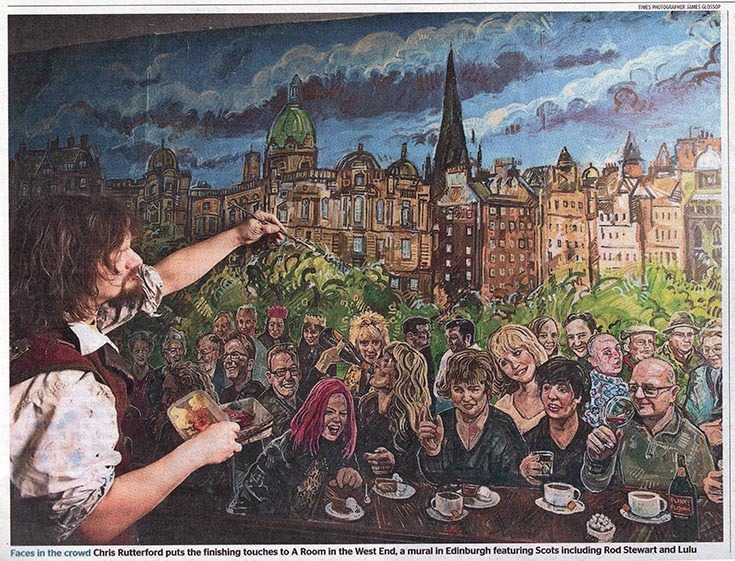 The Big Yin Billy Connolly and Super Gran feature in the mural. The mural also memorialises some close friends and family who passed away recently. 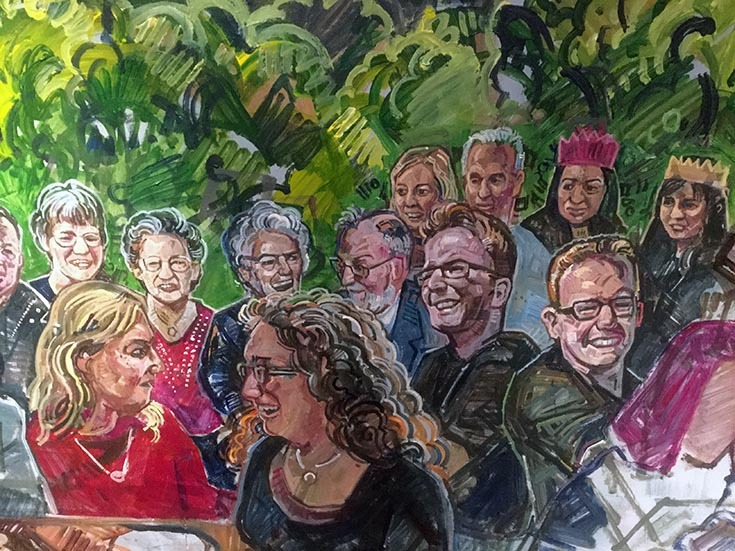 About that time I heard the sad news that a favourite uncle of mine in Orkney, Charlie Rendall, had passed away and so I decided to paint him and his fabulous wife Muriel into the party scene. As I was on that theme, I added the portraits of two of my favourite aunts who passed away some years ago, and also my good friend Adriana together again with her daughter Chiara, who sadly also passed away. Leith favourites The Proclaimers are all smiles with Shirley Manson of Garbage. 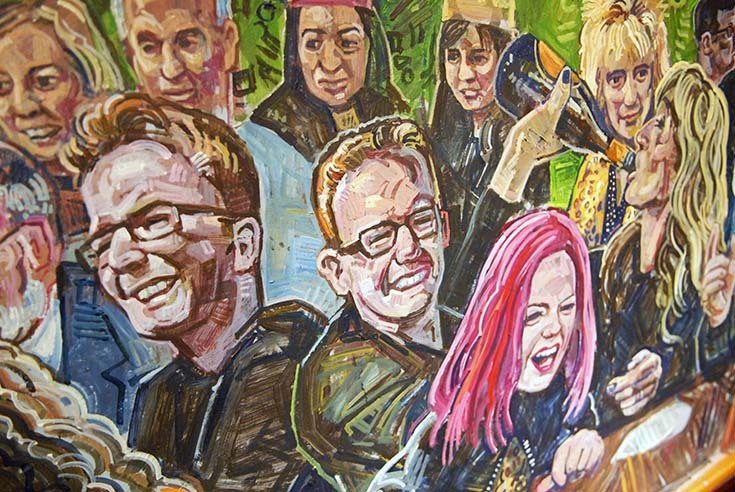 As I dug up more Scottish-themed photo reference, it was becoming obvious to me that it was really becoming a nostalgia mural and so I popped in Leith favourites The Proclaimers. 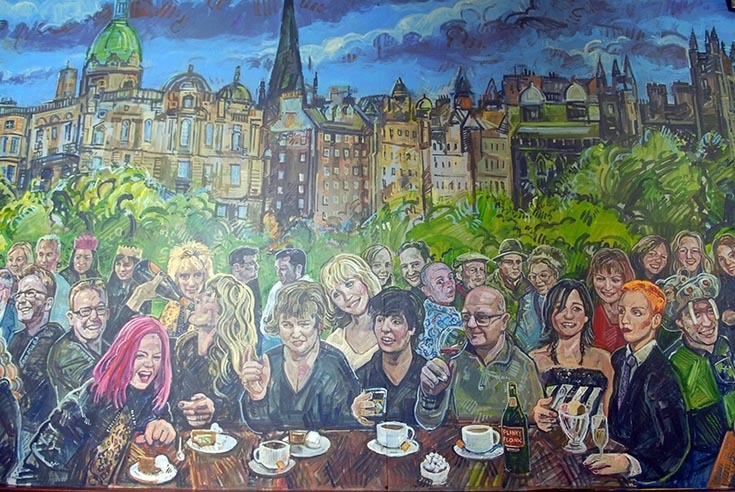 Next to them I added my wife Fiona chatting up the lady from the dress shop up the road, followed by my wife’s friend Nicky swigging from a bottle of champagne while her good friend and Edinburgh rock goddess Shirley Manson from the band Garbage is laughing away. The rock chick table enjoys the company of restaurant owner Peter Knight. About this time restaurant owner Peter’s brother Andy was seeing the Facebook updates and asked where he was in the mural. I decided to expand the rock chick table and have Peter drinking a glass of wine with Shirley, Nicky, Susan Boyle, Lulu, KT Tunstall and Annie Lennox, while Lorraine Kelly looked on in the background. I thought that sounded like a fun table to dine at. Behind them I put Andy – he’s a bit of a character so I found a funny picture of him on his Facebook page and popped him in the background, being bored (along with the rest of the Still Game cast) by one of Isa Drennan’s gossipy stories. International movie star Sean Connery looking disconcerted between the Rutterford brothers, Danny and Chris, as their friend “Glasgow” Andy looks on. 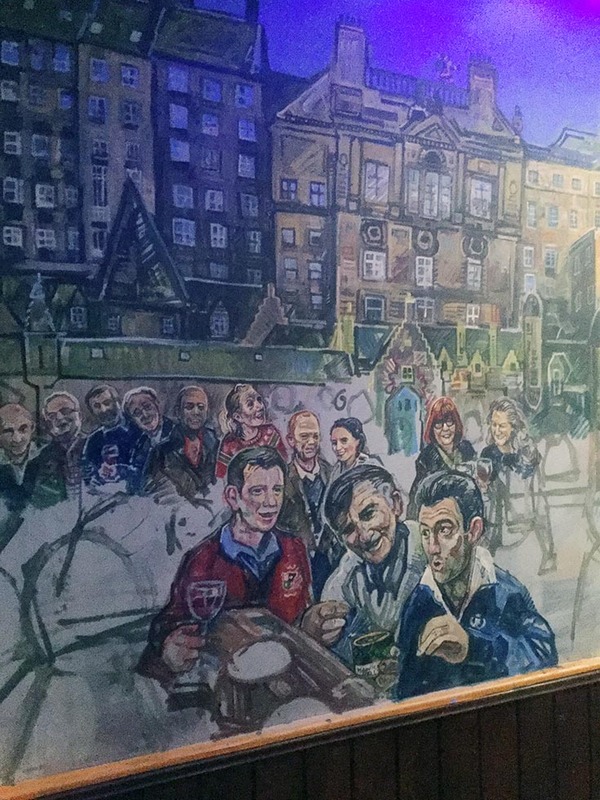 I was coerced into putting myself in the signature spot at the far right end of the painting, so I also popped the rest of the Scots that I go on annual “Tartan Army” rugby tours with. These included my brother Danny (with his trademark hippo hat on) and our friend Andy, wearing a classic combo from a tour gone by – dressed as a captain from the German epic war film Das Boot. I thought it would be funny to make Sean Connery sit at the table with us, looking a bit grumpy. 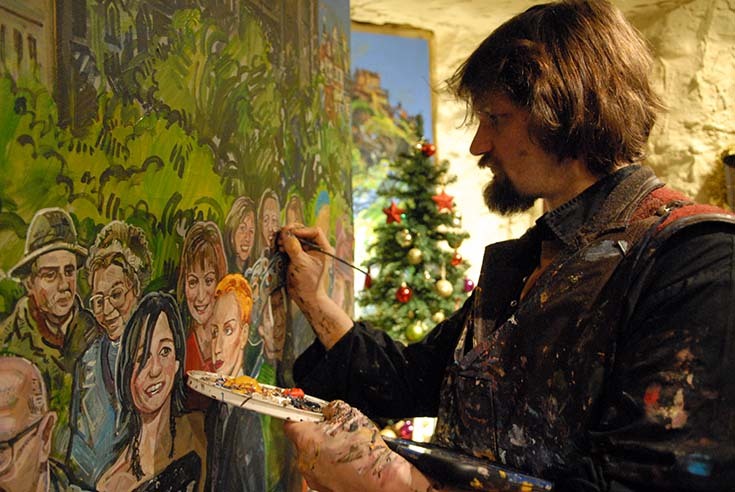 Chris adding detail to portraits, shortly before Christmas. I moved back to the middle of the restaurant and started to work left, heading toward North Bridge. 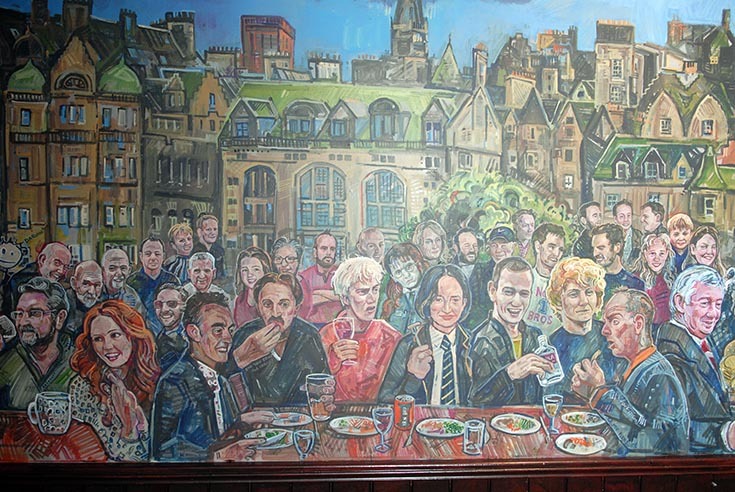 I managed to paint a few more rugby legends in, including Boroughmuir stalwart and British Lion Bruce Hay, and the great Scotland coaching duo Ian McGeechan and Jim Telfer. 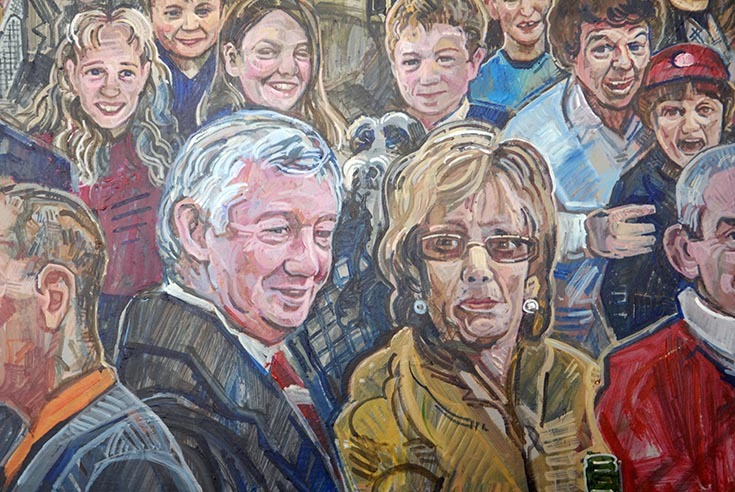 I was just starting work on Alex Ferguson and his wife when the Christmas holidays intervened. I stopped for a few weeks over Christmas for the festivities and to have a trip to Orkney for Hogmanay. Before Christmas I had been getting up at six am and arriving on site at seven so that Peter could let me in to the restaurant before he dropped his kids off at school. That way most days I could paint about ten portraits by lunchtime, when the restaurant got busy I would need to clear out. The cast of the first Trainspotting film with director Danny Boyle, plus actress/director Karen Gillan, and tennis stars Jamie & Andy Murray. 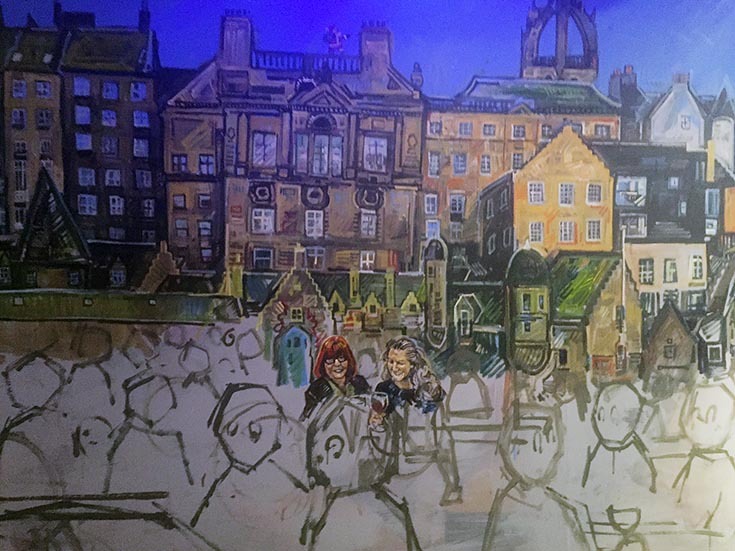 When I got back to Edinburgh after my Orkney trip, the Trainspotting 2 film release was imminent and coincidentally I had been planning on painting the characters from the first film into the mural. My friend Russell had involved in the production as his company ‘Driven Scotland’ provided the cars for the film, and so I said that I would paint the drivers’ portraits behind the Trainspotting stars. I popped Dunblane tennis legends Andy and Jamie Murray behind them, along with children’s TV stars The Krankies. 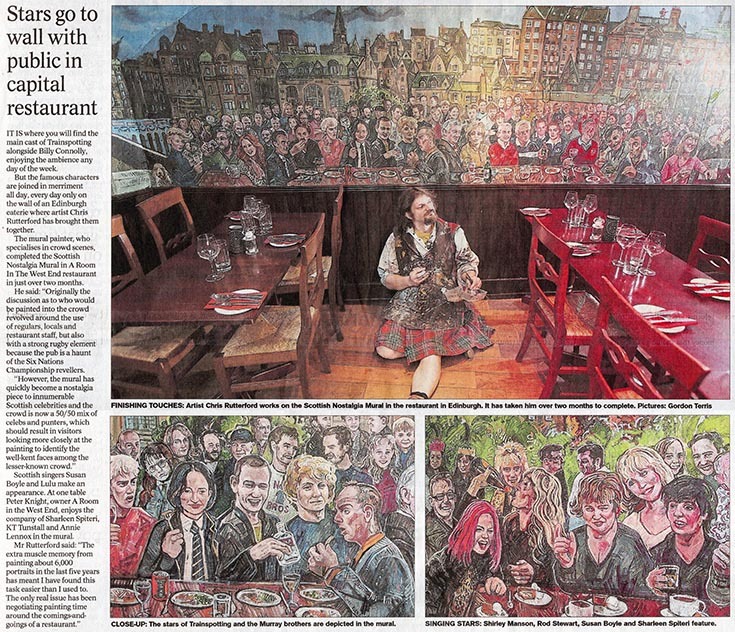 Finally I sat restaurant co-owner John alongside film actress Tilda Swinton and Dr. Who favourite Karen Gillan, so that John wouldn’t feel jealous of Peter being seated at the rock chick table – and then the mural was basically done. 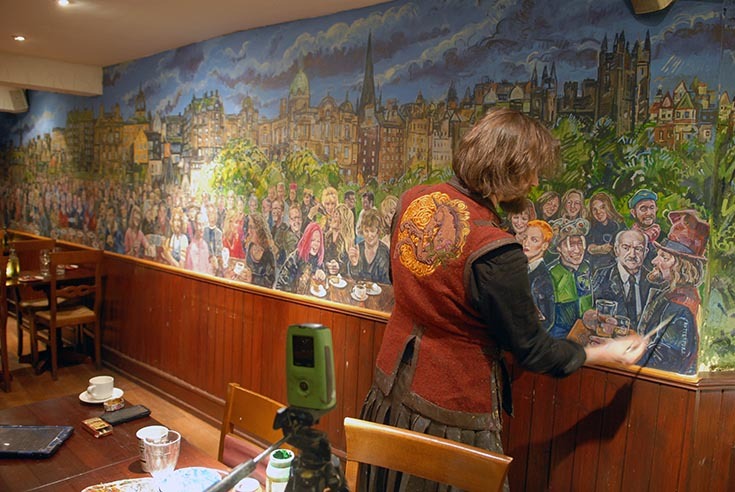 After the completion I made a time lapse film of the creation of the mural which was then released to social media. Billy Connolly kindly give me permission to use the theme tune to Super Gran on the clip, which gave it a really strong Scottish tone without reverting to bagpipes, the name-dropping narrative of the song re-enforcing the celebrity nature of the picture. Chris painting under the watchful eye of one of his time lapse cameras. 27/01/2017 Edinburgh Evening News article. 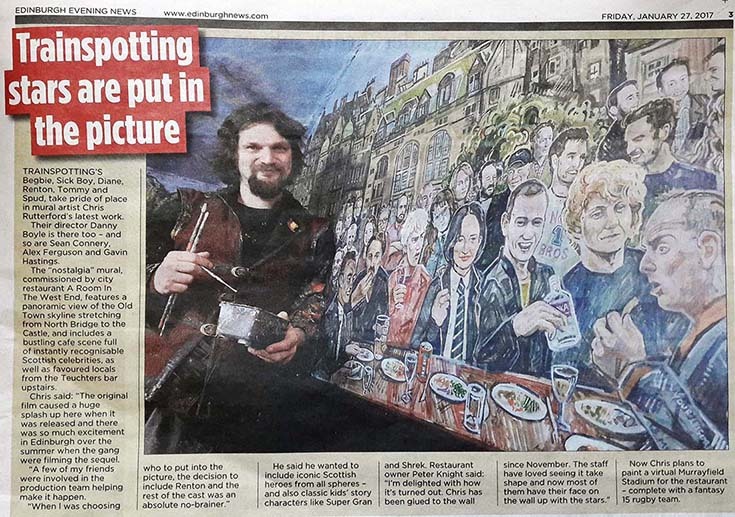 The mural seems to have struck a chord with people as we’ve attracted great widespread national coverage with the mural, appearing in the Edinburgh Evening News, The Times, The Glasgow Herald, The National and The Sun. 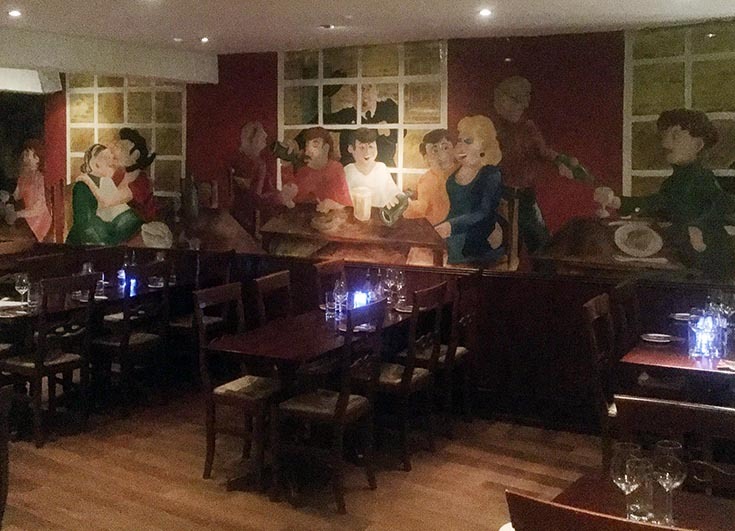 Even better, the mural has received positive feedback from all the staff at the restaurant who have noticed a huge change in the atmosphere, and there is no lack of conversation at the adjoining as diners now celeb spot during their meals. 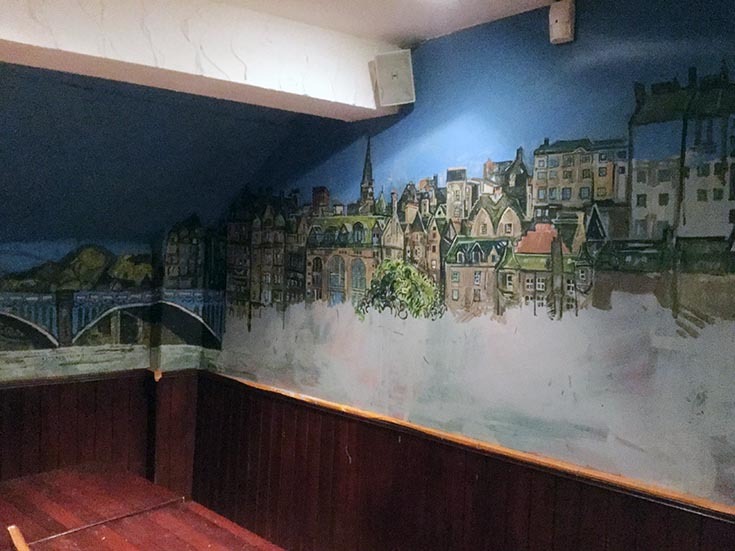 Plans are currently afoot to make further improvements upstairs in Teuchters pub, as well as to sister restaurant A Room in Leith (handily just steps from our new studio in Leith Custom House). The finished mural before the restaurant opened for the day. Co-owner Peter Knight surrounded by rock chicks. Full list of the celebs featured on the walls of A Room In The West End: Tilda Swinton, Shirley Manson, Sharleen Spiteri, Lulu, Annie Lennox, Susan Boyle, Lorraine Kelly, Rod Stewart, The Proclaimers, The cast of Still Game, Andy Murray, Jamie Murray, Danny Boyle, Kelly MacDonald, Shirley Henderson, J.K. Rowling, Ewan McGregor, Ewen Bremner, Jonny Lee Miller, Robert Carlyle, Kevin McKidd, Sean Connery, Princess Anne, Billy Connolly, Alex Ferguson, Bill McLaren, Scott Hastings, Gavin Hastings, John Jeffry, David Sole, Jim Telfer, Ian McGeechan, Andy Irvine, The Krankies, Rikki Fulton, Karen Gillan, Super Gran and Shrek.